Happy New Year! Usually this time of the year, I post about my goals for the entire year, which I typically fail at accomplishing by the end of the year. So this time, I am going with a key phrase: Be active. For writing, "be active" means I need to get back to writing. Last year, I wrote only 25,019 words, which was my worst word count since I started writing with publication in mind on January 15, 2009 (yes, ten years tomorrow!!). I plan to focus on one main project at a time, which will also include research, plotting, and edits. If I have extra time, I might add another, such as re-editing The Fate Challenges, but we'll see. My first focus is the short story collection Folds in Life and Death. Two stories need just another read-through. One story I plan to change from third to first person, and I need to finish writing the fourth story (this week's goal). My tentative release date is mid-February early March. The collection's genres are fantasy and alternate history. "Be active" also relates to my goal to improve my health. For Christmas, I received a Fitbit Versa. The plus side is it's keeping me active. It is also helping me track what I eat. I'm trying to take in fewer calories than I burn a day. So far, so good. The down side is I've found out how little REM and deep sleep I get. It's no wonder I'm so tired! I also tried the relaxation breathing app, and I found out relaxation breathing, or deep breathing, gives me a panic attack. Yeah, I'm weird like that. I'd also love to meet my reading goal of 24 books this year. The last couple years I've fallen short. What are your goals for January or this year? Do you have a key word or phrase? I mentioned in my last post that I have been learning languages through Duolingo. There is something thrilling about learning another language. Language reflects the people who speak it, and you can learn a lot about someone's culture through their language. If you haven't studied a language beyond your first one, I highly recommend it. Especially for writers as it'll help you understand your characters more through how they speak. Klingon is a harsh language, much like the fictional people who speak it. Their sentences are backwards to how we speak English as they focus on what they're doing to someone or themselves more on the subject of the sentence. They also combine words a lot. My favorite phrase is jI'IHbe' 'ach jIval, which means "I'm not beautiful, but I am intelligent." In Danish, they don't seem to be keen on conjugating their verbs. Also, they tack on their indefinite articles (en/et--our "a/an") to the end of their nouns to make them definite (the). Dutch has a mix of German and English, so I find myself picking it up rather quickly. Portuguese uses um/uma for their indefinite articles and o/a for definite articles. It always confuses me the first couple times I see "a" pop up as I want to write "a/an" instead of "the." The language that surprised me as one of my favorites is Chinese. Now, I can't write down the symbols very well, but I am recognizing them more in TV shows and the like. Before I started Duolingo, I would say the secondary language I remembered the most from school was French, but I am finding I retained way more Spanish than I first thought. Now, I'm going to leave you with a brief unedited excerpt from "Paper Faces" in Folds in Life and Death. Willow, the main character, and her BFF Letitia are hanging up theater lights and talking about the upcoming Homecoming dance. In the tech booth is Braden, the guy Willow is in love with. “That’s Star Trek.” My eyebrow lifted. “And you’re sure you’d rather go with Antwan?” Though I wasn’t into science fiction, I knew Star Trek from Star Wars. If these things were important to Antwan, then Letitia should, at the very least, know the difference too. I knew all too well. My gaze drifted toward Braden. He never once looked down on me for who I was. Sorry the word count was so low last year. Look forward to your release in February. I used to speak fluent Japanese. I've forgotten most of it, but if immersed in it again, I'm sure a lot would come back. Glad you are working on healthy habits. Me too. I am trying to get back into walking regularly which I did until I got too busy last year. Sorry about your word count but you can only do so much when you aren't feeling well. Hope this is a healthier year for you. My husband keeps threatening to get me a Fitbit since I rely on my phone to track steps. It works though - I'm not dropping below 7000 steps for anything. I'm glad you're putting out that story with another one. Interesting how many people know how many words they wrote in a year. I think I want to keep track of that this year. I also hate forced breathing and meditation. I use a prayer journal instead. It's more me and writing things down is my happy place. I like your idea of theme word for the year. Good sleep is really important for health. Good luck with your short story collection. Great goals! I think some of mine are similar. I coincidentally posted about some similar new years goals. Oh, wow, congrats on the ten years of writing with publication in mind! That's impressive. Sorry to hear you've been struggling so much with your yearly word count, though. (Can relate with my art. My yearly total just seems to keep shrinking, and it makes me incredibly insecure.) Focusing on one project at a time will be helpful, for sure. 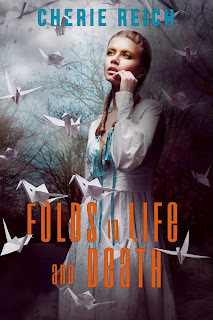 Very exciting that Folds in Life and Death is your first focus--it looks amazing, and that snippet already has me intrigued. Best of luck with this release! I like the snippet! It was fun and made me smile. Great key phrase for the year. Keeping active usually helps my mood, I've found. I'm doing Duolingo too! Japanese for me. I've always wanted to learn, though all I ever picked up were phrases my grandma shouted at my grandpa, such as "BAKA!" Excellent motto for the year! I do love that cover. Hopefully the Fitbit really helps. I'm more seriously considering one these days if only to zap me as a reminder to get out of the chair and move! I used to speak near fluent French, but that's mostly gone. I also took German and Italian for a year in university. Neither I remember much of! Funny. When I read the title, I thought it was about fitness and writing. Getting out of the writing chair and some self care. That said, as long as you're moving forward, you're golden. Word count is less important that writing something compelling anyway. Happy Anniversary! Be Active sounds like an excellent key phrase for the year. I have a FitBit Alta and I really like it. I just have to remember to take it off and stick it in my pocket if I'm pushing a cart around some big box store because otherwise I don't get credit for those steps. If I'm going to brave going to WalMart, I want credit for it. If I had to pick one for this year, it would be "Business." Minding my own and growing it. As for languages, I LOVE Duolingo. My husband speaks some French, so I can kind of converse if the sentences are simple. Used to know Japanese but not very well and I've gotten rusty. Ooh great excerpt! Thanks for sharing it. I don't know any other language but have always been fascinated by them and wished I had more knowledge. Maybe I will give Duolingo a try - that sounds awesome. Here's to Feb! And to meeting those goals. It's great that you're working on health-related goals. Oh man, I totally get how thinking too hard about breathing can give you a panic attack!